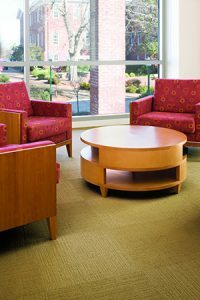 When Library Director Loren Pinkerman came to LaGrange College, he immediately began lobbying for a new building. After 40 years and substantial growth in the student body, it was time. One of former President Stuart Gulley’s primary directives? Make it LEED certified. So the school brought in some experts. 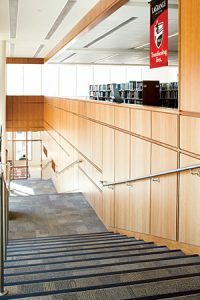 For help planning the building, the school went to Jay K. Lucker, a former Director of Libraries for MIT who has served as a library building and management consultant to numerous universities and colleges, to work with real estate developer Partners Development. And with additional help from sustainable building consultants Southface and Holley Henderson of H2 Ecodesign, a LEED Silver building was born. The Short Story – Why Interface? The Frank and Laura Lewis Library ultimately achieved LEED Silver certification. 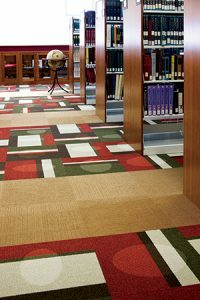 The library’s green features will offer lower operating costs, a healthier work and study environment and less solid waste for local landfills, which all translates to a better quality of life for LaGrange College and the greater community. 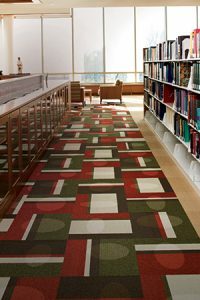 One of the many features that played a role was the Interface carpet tile used throughout the space. 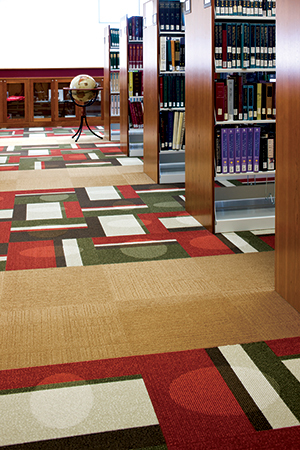 Interface is a world-leading modular flooring company with a fully integrated collection of hard and soft flooring tiles that effortlessly fit together into a modular design system. Around the world, we help our customers create interior spaces that positively impact the people who use them and our planet. Interface continues to be one of the world’s most innovative and inspirational companies with a commitment to design and sustainability. For 20 consecutive years, Interface has been recognized as one of the most sustainable companies in the world. Our mission, Climate Take Back™, invites industry to join us as we commit to running our business in a way that is restorative to the planet and creates a climate fit for life. Headquartered in Atlanta, Interface (NASDAQ: TILE) has planet-first manufacturing facilities across four continents. For additional information: interface.com and blog.interface.com. * This article was written by Interface; FMLink is not responsible for the accuracy of its content. Should anyone wish to contact FMLink regarding any article, please e-mail FMLink at support@fmlink.com. Contact information for each organization is provided inside each paper and in the Contact All Providers section under ARTICLES. How do sustainable building materials affect occupant comfort? See what this Saint-Gobain study revealed June 22, 2018 In "Surveys and Trends"
NeoCon 2018: For eco-friendly flooring with seamless transitions, see Interface’s new carpet tiles and luxury vinyl tiles July 9, 2018 In "Products and Services » Carpeting & Flooring"